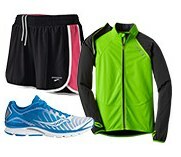 I like today's part of REI's 10 Days of Deals promo , where they are offiering 30% OFF all fitness clothing and footwear. Why? Because this is vlaid for all shapes, genders, and sizes. I should note that these items are already on sale or clearance, so it's a deal on top of a savings. Sounds like a sammich I want to eat for lunch. Grab some new shoes, a new outfit, a hydration pack, and whatever else you need to burn those calories.